"Preserved lemon, an essential ingredient in Moroccan cooking, is made by pickling lemons in salt and lemon juice. 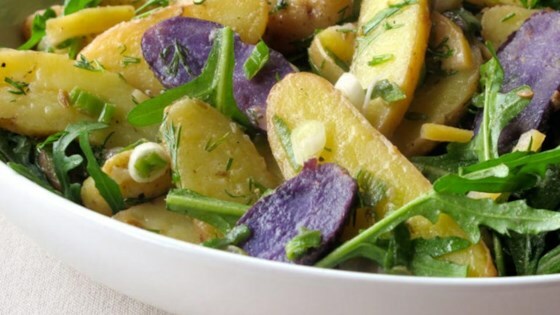 This Potato Salad with Quick Preserved Lemon and Arugula recipe produces a quick version that's ready to use in minutes." Meanwhile, slice 1 lemon into 1/8-inch-thick rounds. Combine sliced lemon, 2 cups water and 2 tablespoons kosher salt in small saucepan; bring to boil. Reduce heat and simmer until lemon slices are tender, about 10 minutes. Drain lemons, then very coarsely chop. Cut remaining lemon in half and squeeze out enough juice to measure 2 tablespoons. Mix chopped lemons, 2 tablespoons lemon juice, white balsamic and oil in small bowl. Coarsely crush cumin and coriander seeds using mortar and pestle (or wrap in foil and pound firmly using rolling pin). Mix seeds into lemon dressing. Season to taste with pepper. I was afraid this would be too lemony, but it was great! This will be on our table again and again!! I LOVE the bright citrus, the salty dressing, the peppery arugula and the creaminess of the potatoes. I'm a non-potato-salad-girl, converted.